The Bakun dam is a large dam located in the Borneo, Sarawak, Malaysia. The dam has being built by Sinohydro (a state-owned Chinese company specialized in large dam construction all over the world), in collaboration with sate-owned Sarawak companies, such as Sarawak Energy and Sarawak Hidro, the national firms in charge of the project and electricity distribution . The construction of the dam has been a source of conflicts between the State Government of Sarawak, international and local NGOs and indigenous people since the planning of the project until today. Oppositions of indigenous communities in collaboration with NGOs against the State Government of Sarawak and the main dam contractors started in 1997, when they asked the main contractor of the dam and the State government to abandon the project because considered unnecessary, since the energy demand of the country was already covered by the electricity produced; negative from an environmental point of view, one third of Sarawak’s remaining primary forest is located in the dam site area; and negative from a social point of view – the construction of the dam forces the displacement of indigenous communities living in the affected forest . 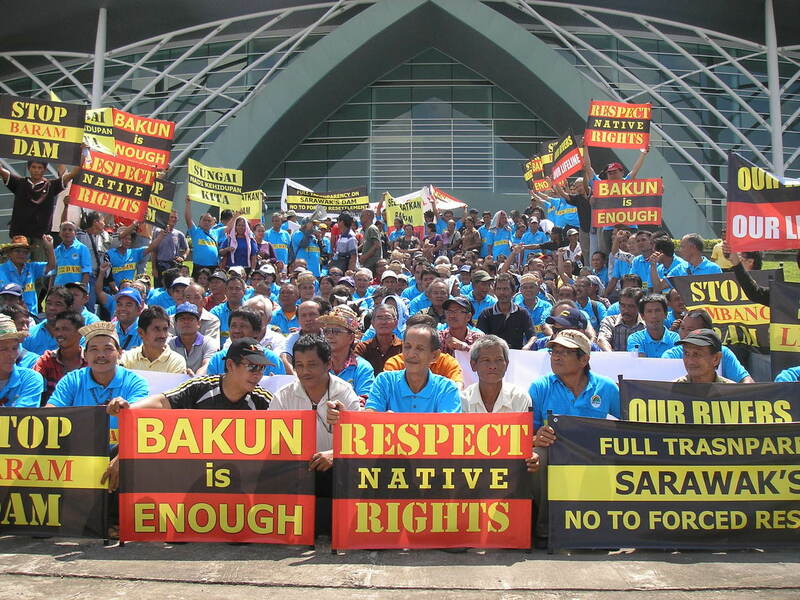 Moreover, in 1998 the Bakun Region People’s Committee asked the State Government of Sarawak and the Bakun Resettlement Committee to abandon the resettlement of the Bakun residents . In spite of the oppositions reported above the construction of the dam went on and it officially started operation in 2011. The construction of the dam has caused the inundation of 700 square kilometres of forests and farmland around the dam site. As a consequence 10,000 residents have being displaced from their previous settlements to new villages . The reservoir has also experienced high nitrogen loading, because the vegetation located behind the dam was not previously cleared. The surrounding land upstream is also used for industrial agriculture such as palm oil plantations, whose chemical runoff has deposited nitrogen-heavy sediment into the reservoir, causing water acidity and erosion. The potent methane emitted by the reservoir can be smelled kilometers away . Today a grassroots movement of Sarawak indigenous leaders, the SAVE Rivers Network, along with the national Indigenous Peoples network, Jaringan Orang Asli Se-Malaysia (JOAS) are working with resettled communities to help them to raise their voices in relation to a series of concerns related to Bakun dam and the resettlement project . In particular, the points of conflicts refer to different social and environmental aspects, as follows: (1) land scarcity after displacement (each household was promised 10 acres of farmland but was only provided 3 acres) and poor land fertility for cultivation in the resettlement area  (2) lack of access to farm road (3) inadequate compensation for land that was flooded (4) reduced access to forest products for subsistence, such as plants and animals. Less diversity of flora and fauna in the resettlement areas with respect to the old settlement (5) land conflicts between resettled communities and private oil palm plantation companies (6) Poor water quality in the resettlement areas and lack of control over the quality of the water by the Government. In addition, for the first time in February 2012, 150 indigenous representatives from areas already affected or to be affected by dam projects, including Bakun dam, shared their experiences at a conference organized by the ‘SAVE Rivers Network’. At the end of the conference, conference organisers shared the results: Sarawak’s previous construction of dams, including Bakun dam, has violated international human rights and environmental standards such as the UN Declaration on the Rights of Indigenous Peoples as well as basic rights guaranteed under the Malaysian constitution such as the right to property . Moreover, during the International hydropower Association (IHA) conference, held in Sarawak Malaysia in May 2013, ‘SAVE Rivers Network’ together with affected indigenous people, including communities affected by Bakun dam, and indigenous people who will be affected by new dams, organized a street protest against the construction of new dams in Sarawak . Despite these arguments, the project is operational and people displaced. Report prepared by the Bruno Manser Fund, a charitable association registered in Basel, Switzerland. Damming Our Future sheds light on the impacts that will take place if 12 more mega-dams are constructed in Sarawak, Malaysia. Other Comments This case is being studied under an ESRC funded project entitled ‘China goes global: a comparative study of Chinese hydropower dams in Africa and Asia’ by the School of Oriental and African Studies SOAS. Interviews with community members, government officials and dam builders were carried out.